I sure you all ever drink this Kickapoo right...but not all the people can tell what's the picture in there looks like....most of you including me only know the tin is green and yellow and in the center macam got picture saja and a big word KICKAPOO. So two days ago I makan at the Trio restaurant and order this KICKAPOO. When I finish my meal and wait for my friend I boring boring and look at the can... so that the first time i really spend the time to look at the kickapoo can.. the picture is like a red indian and a fat man look like a Santa Claus sit in a barrel fly out from the earth and and explode but both of them still look happy!!!! Ok first of all what is Kickapoo mean...is a member of an American Indian people formerly living in Wisconsin, and now inKansas, Oklahoma, and north central Mexico. 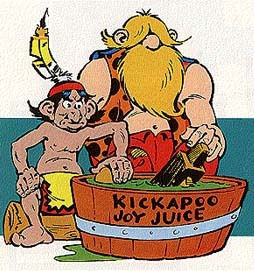 So how is this Kickapoo joy juice was invented? Lupanya got story one... is from a cartoon Li'l Abner created by Al Capp. In the story the fat guy is name Hairless Joe and the Red Indian is Lonesome Polecat they both mix and match out the drink in a cave!! For more info you can see HERE but first see the video below dulu and you'll know how Kickapoo born!! !